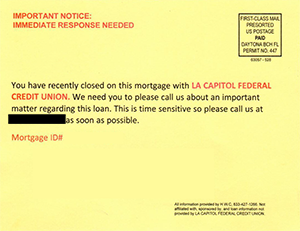 Please be advised that there are fraudulent postcards being sent to some La Capitol FCU members. The cards direct people to call a phone number regarding an important matter about a mortgage or loan from La Capitol. This is a fraudulent attempt to collect your personal information. DO NOT CALL the number on the card or provide your information. There may be some variation in the text or color of the card. The image shown is one of the versions recently seen.